Allium species plants include onions, garlic, chives, scallions, and shallots. Allium plants, particularly onions and garlic, provide many health benefits to humans, but they are toxic to cats and dogs. The risk is higher for cats, but even big dogs are vulnerable to Allium species toxicosis if they consume larger quantities. Eating bulbs, stems, or flowers of Allium plants or products made from them can trigger changes in red blood cells that may cause a serious illness called Heinz body anemia. Cooking or dehydrating these foods doesn’t eliminate the risk, so powders and products containing them such as cooking mixes, dietary supplements, and processed snacks are equally dangerous to pets. Allium species toxicosis can be caused by either a single large ingestion or the cumulative effects of regular small doses. Health problems always occur when a cat or dog ingests more than 0.5% of his or her body weight in onions or onion powder (for an 8-pound cat, this amounts to about 18 grams, or just over a tablespoon), though even smaller doses may create problems, particularly when consumed on multiple occasions. The tiny amounts of garlic found in some commercial pet foods are considered safe. However, the minimum amount that will cause problems for a given pet is unknown, so it’s best to avoid feeding pets any products with Alllium species ingredients. Allium species poisoning can be fatal, and there is no antidote. If a pet has been poisoned, treatment includes gastrointestinal decontamination and treating the resulting anemia, along with general supportive care. Some pets require supplemental oxygen therapy and blood transfusions. There are many Internet sources that recommend using garlic as a flea repellent for pets, either by feeding it to them or applying it to their fur. Even external application is a bad idea. Animals will ingest the garlic when they groom themselves, putting them at risk for toxicosis. For safe, nontoxic ways to get rid of fleas, see Natural Flea Control. 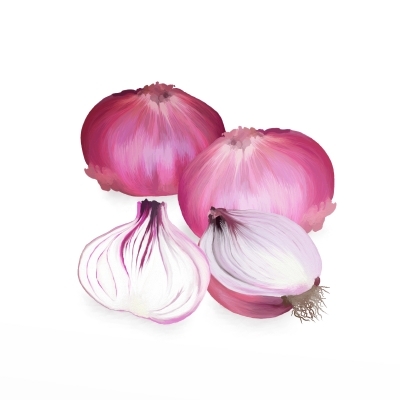 Keep onions and other Allium species plants and foods containing them out of reach. This includes chives, which are appealing to cats due to their grass-like texture. Read labels on food products and dietary supplements before feeding them to pets. In particular, many owners feed human baby food to kittens, puppies, and elderly or ill pets to entice them to eat, but many baby foods contain onion, so checking labels is particularly important with such products. Don’t feed pets table scraps that may contain Allium species ingredients. Such ingredients are often present in sauce mixes and other processed items. For information about other toxic foods and dangerous plants, see the Toxic Foods and Plants pages. American Society for the Prevention of Cruelty to Animals. (2010). “Treats with Garlic” and “How Bad Is Garlic for Cats?” ASPCA.org. Bowen, J. (2 December 2007). “Garlic and Onions Can Create Problems for Some Pets.” The Roanoke Times, Roanoke.com. Drs. Foster & Smith, Veterinary and Aquatic Services Department. (2009). “The Use of Garlic and Onions in Dogs and Cats.” PetEducation.com.